Next thing I want to show you is how compound interest works. It’s interesting, we’ve had several people who’ve never even heard of compound interest. Compound interest is powerful. They can’t prove this but Einstein said that compound interest was the eighth wonder of the world. He said, “Either you can earn it or you can pay it. It’s your choice.” It’s either working for you or it’s working against you. If you know how it works and if you know what’s necessary for it to work, you’ll be able to be in control of it. This is a very graphic example. This assumes a hundred percent compounding, which could happen but is not likely. It’s dramatic and I want you to see it because it expands it for you to really catch the idea. 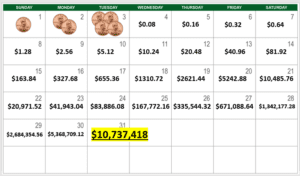 We start with a penny on the first day and because we’re compounding, we get two on the second day. The compounding then means on the third day we have four. The fourth day we have eight and on the fifth day, we have 16. You see the compounding? By the 22nd day, we have $20,971. And then life happens. Life happens one day and suddenly we have a medical bill or need a new car. We put a down payment on a house or we have to send one of the kids off to college. That compounding immediately stops because we had to use that money. In life, it could have also been my money in the markets. It could have been a fund and I had a loss or reversal in the fund like 2007, 08, 09 and 10. When people’s stuff was climbing like crazy and then suddenly they had a 40 to 60% pull back. That’s an interruption in the compounding. In order for compounding to work for us, compounding has to be uninterrupted and continuous. Up until this point, it’s been uninterrupted and continuous and the penny is now $20,971. Once interrupted, we have to start over. 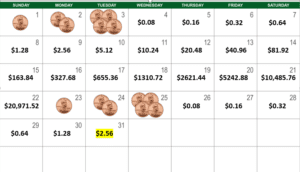 One penny to two and at the end of 31 days we have $2.56. Can you guess how much that would have been on day 31 if the compounding had never been interrupted? Now you get the idea. Compounding interest can make you money but it has to be uninterrupted and continuous. The size of the compounding is not as relevant although the bigger the better. If someone is not wealthy beyond measure from their compounding interest, it’s because it’s been interrupted the markets or by life. One of the two. 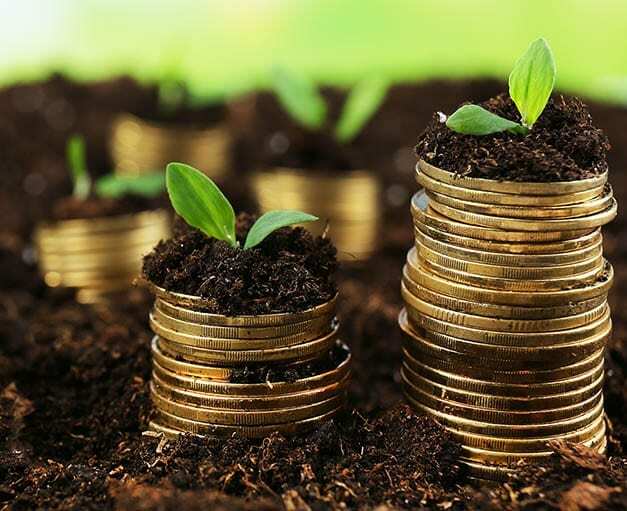 Are you habitual about your savings? I’m actually chatting with you right here in the front seat of the car. We live up in the mountains, and when you have an all day, filled day full of appointments in the Valley, most of these videos, or catching up on work is gonna be from the front seat of the car. Well, we are going to learn some things today. You’re going to be challenged and we’re going to have fun. If you’re not having fun, then let’s check in and find out why. But we are going to have a good time with this. You’re going to be challenged. You truly are. As Marcy said, we’ve had the privilege of teaching this around the country and it’s always … there’s no greater joy than to be watching somebody’s face when all of a sudden they get it. Or they get upset. And that might happen to some of you, too, when they start to realize how it’s worked and how long that they didn’t have a clue. It’s amazing how many people actually get upset about what they’re finding out. So what I began to learn is that the elite wealthy actually played on a different playing field, that they actually had a different set of rules that they played by, financial rules that they played by. The information the rich have that you simply don’t. Whatever the mind of man can conceive and believe, you can achieve. You know, in America, savings is almost become completely forgotten about. According to a recent survey, 34% of Americans have zero savings and another 35% have less than $1,000. I want to talk to you today about life insurance. It’s a subject that, when you hear that word, it might bring a little bit of anxiety. Have you thought about the volatility of our world? I just want to ask you a quick question. Have you thought about the volatility of our world? Where we’re heading financially? Where we’re heading globally? How Your expenses can expand to equal or exceed your income.